Water Babies - Is it worth the money? Rosie has been going to Water Babies now since she was around 4 months old, and I’ve had a few different messages asking what it’s like and if it’s worth the money so I thought I’d share a bit of info in case anyone else is wondering. I can’t actually believe she’s had her 44th swimming lesson today, and she’s not even 14 months old! Basically, Water Babies are unique because you can start your baby with them from newborn (weight dependant I believe) if you really want to start them early. They have different chapters, and each one consists of ten, thirty minute lessons. The cost of each term is £150. 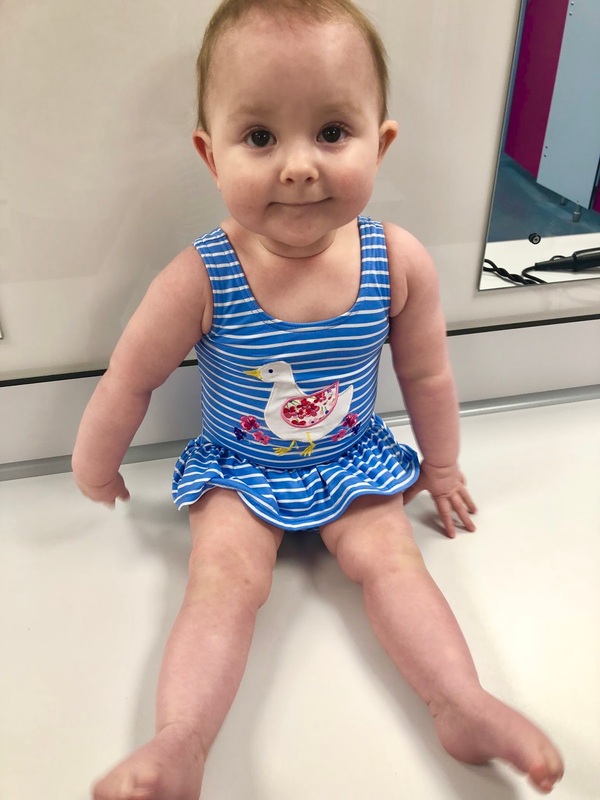 Connor and I had said since before Rosie was born that we wanted her to be a confident swimmer, and also just to be comfortable in the water ready for when we go on holiday. When we heard of Water Babies it sounded perfect, we could get her started as soon as we were ready. The first few lessons are getting you and your baby comfortable in the water, singing songs, splashing and twirling in the water. It’s actually a lot of fun seeing your baby happy in the water and enjoying themselves. It can be a little daunting at first because you don’t know how they will react to the water, but with the guidance of your instructor and a lot of smiling they soon get comfortable and so do you. We’ve had the same instructor, Louise, from the beginning, and Rosie is now up to Chapter 4. We love Louise because as much as certain tasks seem a bit nerve wracking (last week I had to go under the water with Rosie, push off the side and then back up so that we moved around 3 metres under water together!) she’s always really calm and I think that helps to put me at ease. Having the reassurance that she would know what to do in any situation is really comforting for me because I would probably freeze if something went wrong! 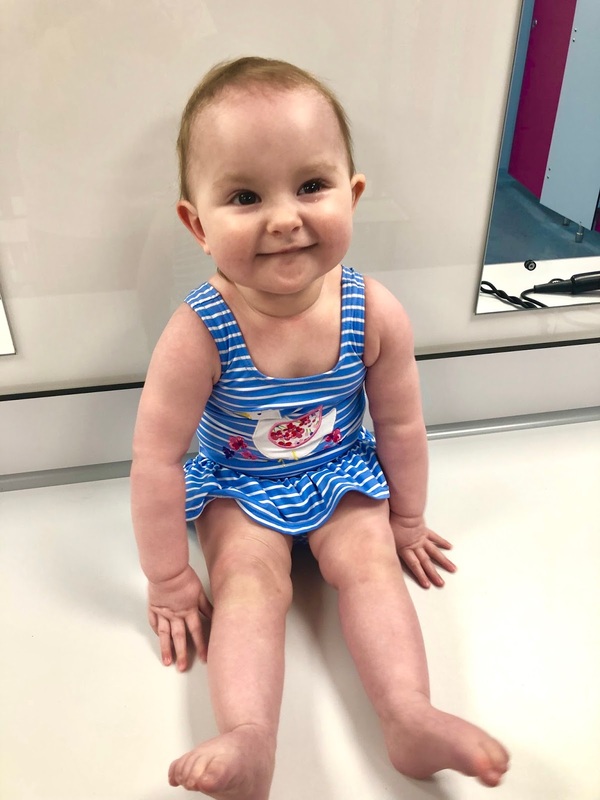 I love the teaching techniques at Water Babies, every movement or instruction we do has a name, so that we can repeat it to Rosie in hope that she will associate the words with the actions. It actually works well because she has recently learned ‘Tiger arms’ which is were she lies on her float on her belly and uses one arm to move forward whilst we sing tiger tiger. Then we move on to the other arm. It amazes me to see that this works especially at such a young age! The swimming aspect is of course the main reason we go to Water Babies, but I think what makes us renew each chapter is the survival skills that are taught within each lesson as well. When we signed up we never actually even considered water safety, because we thought Rosie would be too young to understand anyway. How wrong we was! I’ve lost count the amount of times over the past nine months or so that we have been shocked and impressed by how much Rosie has picked up just from the half an hour lesson each week. An example of this would be, since the beginning we’ve always been told to repeat to Rosie when she gets to the side of the pool ‘hold on, hold on’. It’s so simple yet now in the pool as soon as we are near the side she automatically goes to hold on. It seems so obvious but she has only recently turned one so to have that instilled in her straight away for me is a great achievement. More recently we have been doing false accidents in the pool, so Rosie sits on the side and we pull her in to make a little splash, we then take her under the water, turn her around and bring her back up and say hold on. This is to get her used to going straight for the sides of the pool if for example she was to fall in on holiday. The techniques they use have clearly been trialled and tested vigorously because Rosie’s association with certain aspects now is amazing. We will continue with Water Babies for as long as Rosie continues to enjoy it, and at the moment it doesn’t seem like we’ll be stopping any time soon! I would highly recommend them to anyone thinking of joining. If you have any questions on each chapter or anything else to do with Water Babies, feel free to comment or message me and hopefully I know the answer. This is such a great idea. So great these things are available to help with development. So cute! This is such a great idea. She is so gorgeous Hayley, I really want to get Ru into swimming lessons but I personally think they're so expensive!! Your little girl is seriously adorable! I don’t have kids but I remember taking my baby cousin to swim for the first time and it was magical watching him play and get used to the water!